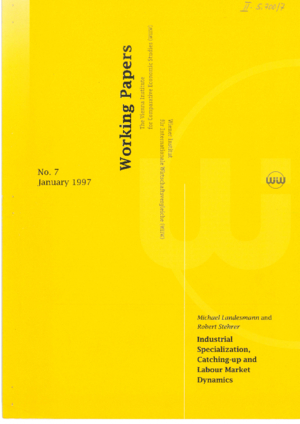 This paper presents a dynamic model as a heuristic tool to discuss issues of changing industrial specialization which arise in the context of catching-up processes of (technologically) less advanced economies and the impact which various scenarios of such catching-up processes might have on the labour market dynamics both in the advanced and the catching-up economies. In analysing the evolution of international specialization, we demonstrate the twin pressures exerted upon the industrial structures of 'northern' economies: competition from 'type-A southern' economies which maintain a comparative competitive strength in labour-intensive and less skill-intensive branches, and competition from 'type-B catching-up' economies, whose catching-up increasingly focuses upon branches in which the initial productivity gaps and hence the scope for catching-up are the highest. The contrast between these two catching-up scenarios allows the explicit analysis of the implications of 'comparative advantage switchovers' between northern and southern (type-B) economies for labour market dynamics.